Western Digital - Caviar Blue 80GB SATA/150 Add up to 80 GB of storage capacity with this Western Digital Caviar SE WD800JD Serial ATA hard drive! Features include an 8 MB buffer 7200 RPM spindle speed and an ultra fast 150 Mbps maximum data transfer rate. 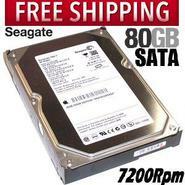 SEAGATE - HARD DRIVE - 80GB SATA/150 3.5 80GB 7200RPM SATA/150 8MB Hard Drive. The large 8 MB buffer provides reliability needed in todays applications! 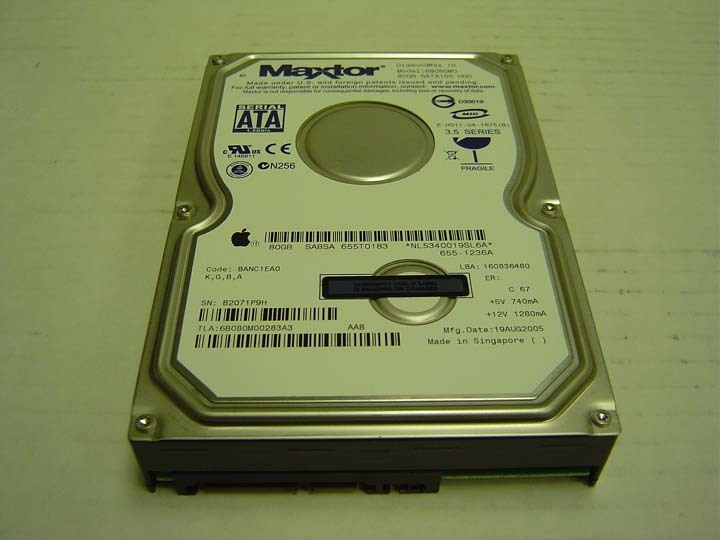 Maxtor - 6L080M0 MAXTOR - DIAMONDMAX-10 80GB 7200RPM 8MB BUFFER ROHS SATA 3.5inch LOW PROFILE (1.0inch) INTERNAL HARD DRIVE (6L080M0). IN STOCK. SHIP SAME DAY. 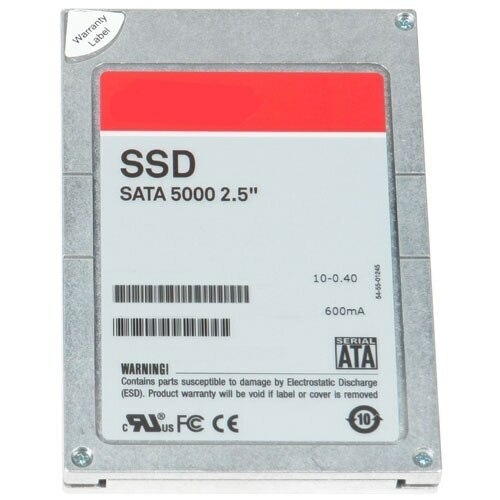 Seagate - ST380815AS SEAGATE - BARRACUDA 80GB 7200 RPM SERIAL ATA-300 (SATA-II) 7-PIN 3.5INCH FORM FACTOR 8MB BUFFER HARD DISK DRIVE (ST380815AS). REFURBISHED. IN STOCK. SHIP SAME DAY. Western Digital - WD800JD WESTERN DIGITAL - CAVIAR BLUE 80GB 7200RPM SATA-II 7PIN 8MB BUFFER 3.5INCH HARD DISK DRIVE. WD800JD IN STOCK.SHIP SAME DAY. Samsung - HD080HJP SAMSUNG - 80GB 7200RPM 8MB BUFFER SATA II 3.5INCH HARD DISK DRIVE (HD080HJP). IN STOCK. SHIP SAME DAY. 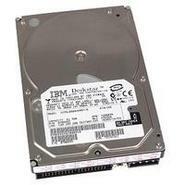 IBM - 25R6902 IBM - 80GB 7200 RPM 3.5inch SATA-150 HARD DISK DRIVE FOR 306 M (25R6902). IN STOCK. SHIP SAME DAY. Western Digital - ST380819AS SEAGATE - BARRACUDA 80GB 7200RPM SERIAL ATA-300 (SATA-II) 3.5INCH FORM FACTOR 8MB BUFFER INTERNAL HARD DISK DRIVE (ST380819AS). IN STOCK. SHIP SAME DAY. Hewlett Packard - 342726-001 HP/COMPAQ - 80GB 7200RPM SATA 7PIN 3.5INCH HARD DISK DRIVE FOR WORKSTATIONS XW SERIES. 342726-001 IN STOCK. SHIP SAME DAY. Hewlett Packard - 436242-001 HP/COMPAQ - 80GB 7200RPM SATA-II 7PIN 3.5INCH HARD DISK DRIVE (436242-001). IN STOCK. SHIP SAME DAY. SEAGATE - HARD DRIVE - ST380013AS SEAGATE - BARRACUDA 80GB 7200 RPM SATA 8MB BUFFER 3.5 INCH (1.0 INCH) LOW PROFILE HARD DISK DRIVE (ST380013AS). IN STOCK. 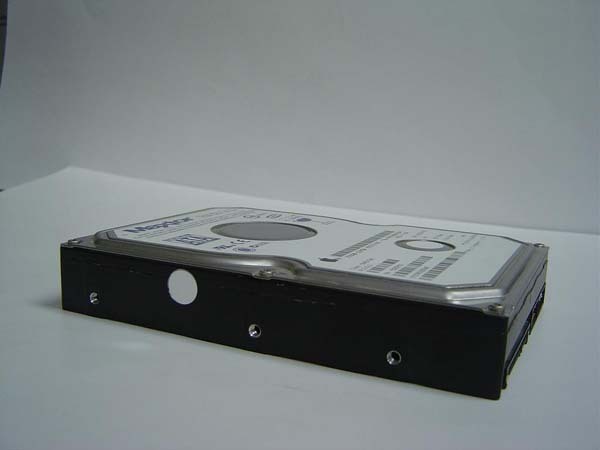 IBM - 71P7293 IBM - 80GB DESKSTAR 7200RPM SATA HARD DISK RIVE (71P7293). IN STOCK. SHIP SAME DAY. IBM - 40Y9034 IBM - 80GB 7200RPM SATA 3.5inch HARD DISK DRIVE (40Y9034). IN STOCK. SHIP SAME DAY. 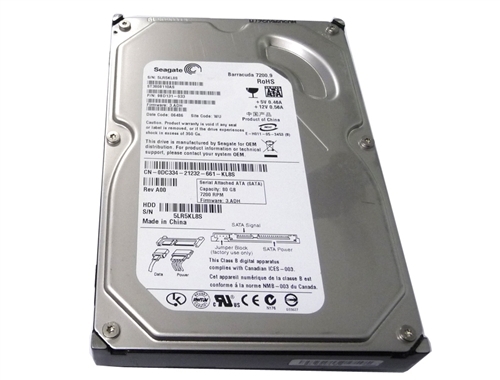 SEAGATE - HARD DRIVE - ST380011AS SEAGATE - BARRACUDA 80GB 7200RPM SATA-150 8MB BUFFER 3.5 INCH INTERNAL HARD DISK DRIVE (ST380011AS). REFURBISHED. IN STOCK.SHIP SAME DAY. 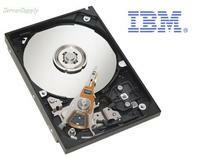 IBM - 13M7742 IBM - 80GB 7200RPM 3.5inch SATA-150 HARD DISK DRIVE FOR 306M (13M7742). IN STOCK. SHIP SAME DAY. Hewlett Packard - 432392-001 HP/COMPAQ - 80GB 7200RPM SATA-II 7PIN 3.5INCH LOW PROFILE (1.0inch) HARD DRIVE(432392-001).IN STOCK. SHIP SAME DAY. Dell - Y3053 DELL - 80GB 7200RPM 8MB BUFFER SATA 3.5inch HARD DISK DRIVE (Y3053) FOR DELL DIMENSION. IN STOCK. SHIP SAME DAY. 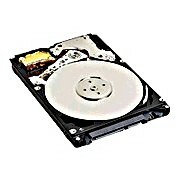 Dell - W3004 DELL - 80GB 7200RPM 8MB BUFFER SATA 3.5INCH LOW PROFILE (1.0inch)HARD DISK DRIVE(W3004). IN STOCK.SHIP SAME DAY. 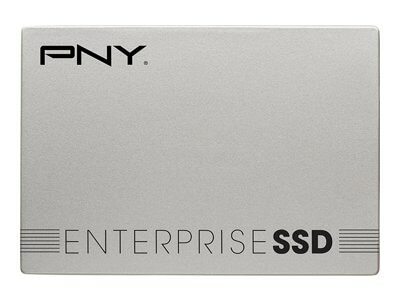 Dell - Y3392 DELL - 80GB 7200RPM 8MB BUFFER SATA 3.5INCH HARD DISK DRIVE(Y3392) FOR DIMENSION 4700. IN STOCK.SHIP SAME DAY. Seagate - ST380817AS SEAGATE - BARRACUDA 80GB 7200 RPM SATA HARD DISK DRIVE. 8MB BUFFER 3.5INCH LOW PROFILE(1.0 INCH). ST380817AS IN STOCK. SHIP SAME DAY. 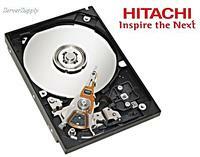 Hitachi - HDS728080PLA380 HITACHI - 80GB 7200RPM 8MB CACHE 3.5INCH SATA 7-PIN HARD DISK DRIVE (HDS728080PLA380). IN STOCK. SAME DAY SHIPPING. 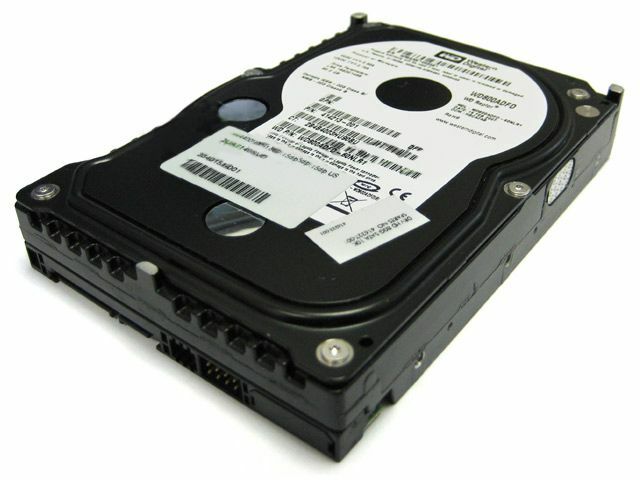 IBM - 09N4253 IBM - 80GB 7200 RPM 8MB CACHE 3.5inch SATA-150 HARD DISK DRIVE(09N42 53). IN STOCK. SHIP SAME DAY. IBM - 73P8002 IBM - 80GB 7200RPM SATA SIMPLE SWAP 3.5inch HARD DISK DRIVE WITH EZ TRAY (73P8002) FOR X-SERIES X206 X306 SERVERS. IN STOCK. SAME DAY SHIPPING. Hitachi - 0A30358 HITACHI - 80GB 7200RPM 8MB BUFFER 3.5inch SATA HARD DISK DRIVE (0A30358). IN STOCK. SHIP SAME DAY. Hitachi - 0A30356 HITACHI - 80GB 7200RPM 8MB BUFFER 3.5inch SATA HARD DISK DRIVE (0A30356). IN STOCK. SHIP SAME DAY. Hewlett Packard - 404587-002 HP/COMPAQ - 80GB 7200RPM SATA 7PIN 3.5INCH HOT-PLUG HARD DISK DRIVE (404587-002). IN STOCK. SHIP SAME DAY. Hewlett Packard - 391333-004 HP/COMPAQ - 80GB 7200RPM SATA 7PIN NON HOT-PLUG 3.5INCH HARD DISK DRIVE (391333-004). IN STOCK.SHIP SAME DAY. Dell - KC297 DELL - 80GB 7200RPM 8MB BUFFER SATA 3.5inch LOW PROFILE (1.0inch) HARD DISK DRIVE (KC297). IN STOCK. SHIP SAME DAY. 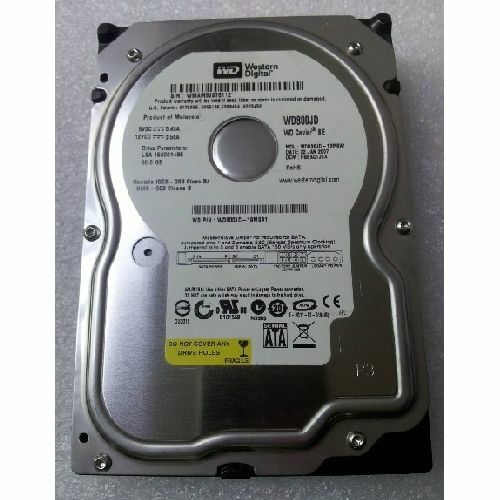 Dell - W0109 DELL - 80GB 7200RPM 8MB BUFFER SATA 3.5INCH HARD DISK DRIVE (W0109). IN STOCK. SHIP SAME DAY. IBM - 39M4500 IBM - 80GB 7200RPM 8MB BUFFER SATA-II HARD DISK DRIVE(39M4500). IN STOCK. SHIP SAME DAY. IBM - 39M4503 IBM - 80GB 7200RPM 8MB BUFFER SATA SIMPLE SWAP HARD DISK DRIVE(39M4503). IN STOCK. SAME DAY SHIPPING. Seagate - ST380811AS SEAGATE - BARRACUDA 80GB 7200 RPM SATA-II HARD DISK DRIVE. 3.5 INCH LOW PROFILE(1.0 INCH) (ST380811AS). IN STOCK. SHIP SAME DAY. Hewlett Packard - 390595-001 HP/COMPAQ - 80GB 7200RPM 7PIN SATA-II 3.5INCH LOW PROFILE (1.0inch) HARD DRIVE (390595-001). IN STOCK. SHIP SAME DAY. Dell - K1836 DELL - 80GB 7200RPM 8MB BUFFER SATA 3.5INCH LOW PROFILE (1.0INCH) HARD DISK DRIVE (K1836). IN STOCK. SHIP SAME DAY. Dell - G1698 DELL - 80GB 7200 RPM 8MB BUFFER SATA 3.5 INCH HARD DISK DRIVE(G1698). IN STOCK. SHIP SAME DAY. IBM - 30R5093 IBM - 80GB 7200RPM SATA HOT SWAP HARD DISK DRIVE WITH EZ SWAP TRAY (30R5093). IN STOCK. SAME DAY SHIPPING. Hewlett Packard - 383410-B21 HP/COMPAQ - 80GB 7200RPM SATA 7PIN HARD DISK DRIVE FOR SERVER OPTION ML110 ML310. 3.5inch LOW PROFILE(1.0inch). (383410-B21) IN STOCK. Hewlett Packard - 332649-003 HP/COMPAQ - 80GB 7200RPM SATA 7PIN 3.5inch LOW PROFILE (1.0inch) HARD DISK DRIVE FOR WORKSTATIONS XW SERIES (332649-003). IN STOCK. Hewlett Packard - 391333-002 HP/COMPAQ - 80GB 7200RPM SATA 7PIN 3.5INCH HARD DISK DRIVE(391333-002). IN STOCK. Hewlett Packard - 407525-001 HP/COMPAQ - 80GB 7200RPM SATA 7PIN 3.5INCH HARD DISK DRIVE (407525-001). IN STOCK. SHIP SAME DAY. Hewlett Packard - 431688-001 HP/COMPAQ - 80GB 7200RPM SATA 7PIN 3.5INCH LOW PROFILE(1.0inch) HARD DISK DRIVE (431688-001). IN STOCK.SHIP SAME DAY. 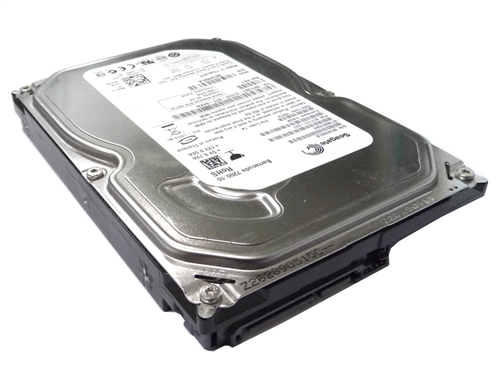 Dell - 4D353 DELL - 80GB 7200RPM 8MB BUFFER SATA 3.5INCH HARD DISK DRIVE (4D353). IN STOCK. SHIP SAME DAY. Seagate - ST3808110AS SEAGATE - BARRACUDA 80GB 7200 RPM SATA-II HARD DISK DRIVE. 8MB BUFFER 3.5 INCH LOW PROFILE(1.0 INCH). ST3808110AS IN STOCK. SHIP SAME DAY. Hewlett Packard - 373311-001 HP/COMPAQ - 80GB 7200RPM SATA 7PIN 3.5INCH FORM FACTOR HARD DISK DRIVE (373311-001). IN STOCK. SHIP SAME DAY. Hewlett Packard - FB080C4080 HP/COMPAQ - 80GB 7200RPM SATA 7PIN 3.5INCH HARD DISK DRIVE (FB080C4080). IN STOCK. Dell - C9313 DELL - 80GB 7200RPM SATA 3.5inch HARD DISK DRIVE(C9313) FOR DIMENSION 3100 / 51000. IN STOCK. SHIP SAME DAY. 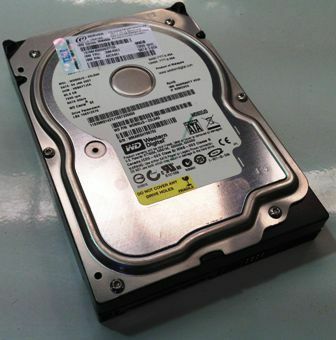 Hitachi - 0Y30005 HITACHI - 80GB 7200RPM 8MB BUFFER SATA-II 7-PIN 3.5INCH HARD DISK DRIVE(0Y30005). IN STOCK. SAME DAY SHIPPING. Hitachi - 0A56411 HITACHI - TRAVELSTAR 80GB 5400RPM 8MB BUFFER SATA-II HARD DISK DRIVE (0A56411). IN STOCK. SHIP SAME DAY. Hewlett Packard - PY276AA HP/COMPAQ - 80GB 7200RPM SATA-II 7PIN HARD DISK DRIVE. 3.5inch LOW PROFILE (1.0inch) (PY276AA) .IN STOCK. SHIP SAME DAY. Hewlett Packard - 391333-001 HP/COMPAQ - 80GB 7200RPM SATA 7PIN 1.5GBPS 3.5INCH HARD DISK DRIVE (391333-001). IN STOCK. SHIP SAME DAY. Dell - UU158 DELL - 80GB 7200RPM 8MB BUFFER SATA-II 3.5INCH HARD DISK DRIVE (UU158). IN STOCK.SHIP SAME DAY. 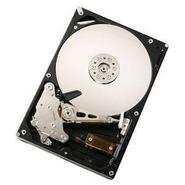 Hitachi - 0A32727 HITACHI - DESKSTAR 80GB 7200RPM 8MB BUFFER 25.4MM SATA-II 7-PIN 3.5INCH HARD DISK DRIVE(0A32727). IN STOCK. SAME DAY SHIPPING. Hewlett Packard - 349237-B21 HP/COMPAQ - 80GB 7200RPM SATA 7PIN 3.5inch LOW PROFILE (1.0inch) HARD DISK DRIVE (349237-B21). IN STOCK. SHIP SAME DAY. Hewlett Packard - 353042-001 HP/COMPAQ - 80GB 7200RPM SATA 7PIN 3.5INCH LOW PROFILE (1.0inch) HARD DISK DRIVE (353042-001). IN STOCK.SHIP SAME DAY. Hewlett Packard - 399967-001 HP/COMPAQ - 80GB 7200RPM SATA 7PIN 3.5INCH NON HOT PLUG HARD DISK DRIVE(399967-001). IN STOCK. SHIP SAME DAY. Hewlett Packard - 440300-001 HP/COMPAQ - 80GB 7200RPM SATA 7PIN 3.5INCH LOW PROFILE (1.0inch) HARD DISK DRIVE (440300-001). IN STOCK. SHIP SAME DAY. Dell - XD673 DELL - 80GB 7200RPM 8MB BUFFER SATA-II 3.5inch HARD DISK DRIVE (XD673). IN STOCK. SHIP SAME DAY. Dell - CC262 DELL - 80GB 7200RPM SATA-II 7PIN 8MB BUFFER 3.5INCH LOW PROFILE(1.0INCH)HARD DISK DRIVE. CC262 IN STOCK. SHIP SAME DAY. Dell - J9058 DELL - 80GB 7200RPM SATA-II 7PIN 8MB BUFFER 3.5inch LOW PROFILE(1.0inch) HARD DISK DRIVE. J9058 IN STOCK. SHIP SAME DAY. 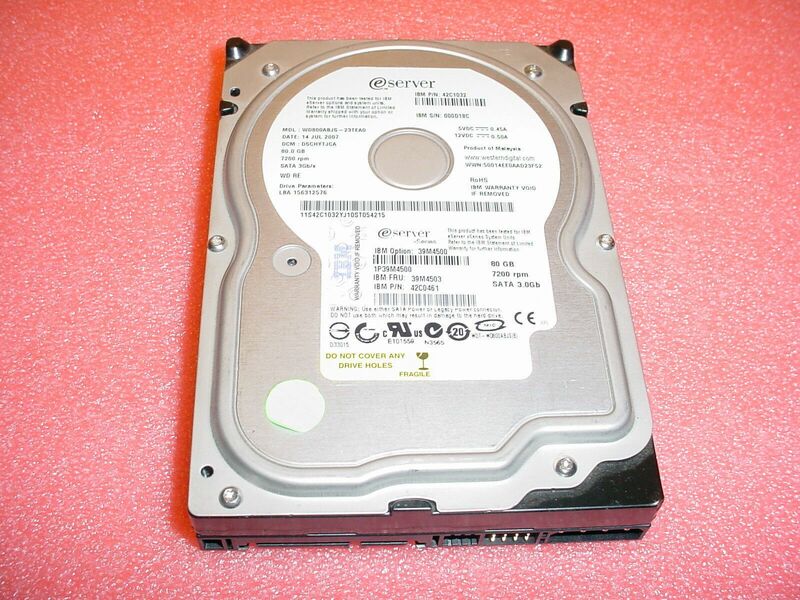 Dell - NR694 DELL - 80GB 7200RPM 8MB BUFFER SATA-II 3.5INCH HARD DISK DRIVE (NR694). IN STOCK.SHIP SAME DAY. Hewlett Packard - 397551-001 HP/COMPAQ - 80GB 7200RPM SATA 3.5INCH HOT SWAP HARD DRIVE. (397551-001).IN STOCK. SHIPS SAME DAY. 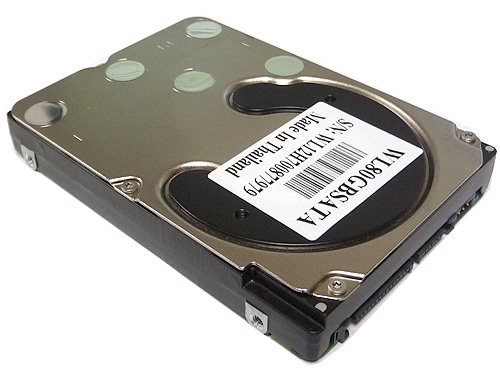 IBM - 39M3701 39M3701 IBM 80GB 7.2K RPM 3.5Inch Form Factor SATA Hard Drive. New Bulk Pack. IBM - 39M4503 39M4503 IBM 80GB 7.2k RPM 3.5Inches Form Factor SATA 3GBPS Hard Disk Krive. New Bulk Pack. Hitachi - HDS721680PLA380 HITACHI - 80GB 7200RPM 8MB BUFFER 25.4MM 3.5inch SATA-II 7-PIN HARD DISK DRIVE (HDS721680PLA380). IN STOCK. SAME DAY SHIPPING. Hewlett Packard - 397377-002 HP/COMPAQ - 80GB 7200RPM SATA 7PIN 3.5INCH HARD DISK DRIVE (397377-002). IN STOCK. SHIP SAME DAY. Hewlett Packard - YAR511W0 HP/COMPAQ - 80GB 7200RPM SATA 7PIN 3.5INCH HARD DISK DRIVE (YAR511W0). IN STOCK. SHIP SAME DAY. Dell - 341-3623 DELL - 80GB 7200RPM 8MB BUFFER SATA-II 3.5INCH HARD DISK DRIVE WITH TRAY(341-3623)FOR VOSTRO 220 POWEREDGE 840 SERVER . IN STOCK.SHIP SAME DAY. Dell - XF541 DELL - 80GB 7200RPM 8MB BUFFER SATA-II 3.5INCH LOW PROFILE(1.0INCH) HARD DISK DRIVE (XF541). IN STOCK. SHIP SAME DAY. IBM - 39M4500 39M4500 IBM 80GB 7.2K RPM 8MB Buffer Hot Swap SATA Hard Drive. New Bulk Pack. 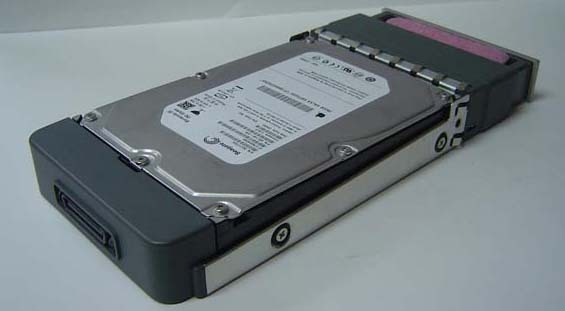 IBM - 42C0461 42C0461 IBM 80GB 7.2K RPM 3.5Inches Form Factor SATA 3GBPS Hard Disk Drive. New Bulk Pack. 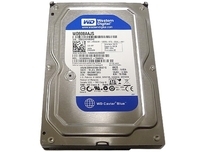 Western Digital - WD800BD WESTERN DIGITAL - CAVIAR BLUE 80GB 7200RPM SATA-II 7PIN 2MB BUFFER 3.5INCH INTERNAL HARD DISK DRIVE (WD800BD). FACTORY REFURBISHED. IN STOCK. SHIP SAME DAY. Dell - UD295 DELL - 80GB 7200RPM 8MB BUFFER SATA-II 3.5INCH HARD DISK DRIVE WITH TRAY(UD295). IN STOCK.SHIP SAME DAY. 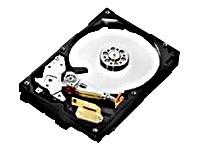 Dell - 341-2270 DELL - 80GB 7200RPM 8MB BUFFER SATA-II 3.5INCH HARD DISK DRIVE WITH TRAY(341-2270). IN STOCK.SHIP SAME DAY. Dell - 341-3047 DELL - 80GB 7200RPM 8MB BUFFER SATA-II 3.5INCH HARD DISK DRIVE WITH TRAY(341-3047)FOR VOSTRO & POWEREDGE SERVER . IN STOCK.SHIP SAME DAY. 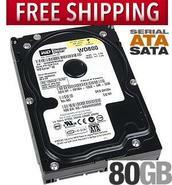 Western Digital - WD800AAJS WESTERN DIGITAL - CAVIAR SE 80GB 7200RPM SATA-II 7PIN 3.5INCH HARD DISK DRIVE. FACTORY REFURBISHED. WD800AAJS IN STOCK. SHIP SAME DAY. 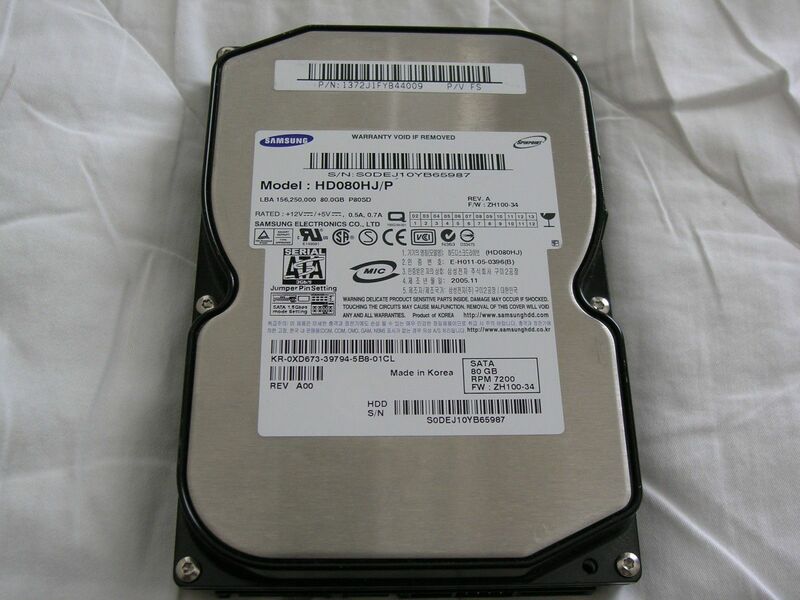 Samsung - HD080HJP HD080HJP Samsung 80GB 7.2K RPM 8MB Buffer SATA II 3.5Inches Hard Disk Drive. New Bulk Pack. Dell - UJ728 DELL - 80GB 7200RPM 8MB BUFFER SATA-II 3.5INCH HARD DISK DRIVE (UJ728). IN STOCK.SHIP SAME DAY.